Talking about the success of the Bharatiya Janata Party (BJP) in implementing the North-East Democratic Alliance or NEDA, party president Amit Shah said that it is Prime Minister Narendra Modi's government that has been successful in establishing this political coalition. The NEDA is a political coalition that was formed on May 24, 2016 by the BJP, along with regional political parties like the Naga People's Front, the Sikkim Democratic Front, the People's Party of Arunachal, the Asom Gana Parishad and the Bodoland People's Front in north-east India. Addressing a crowd today, BJP president Amit Shah said that within these eight states, the state government was successful in implementing the NEDA. "Prime Minister Modi, in his speech, had said that India is divided between two, West and East, where the West is developed while the East is still struggling. And till the time the East is not developed, we can't call India a fully-developed nation," Shah said. Shah further said that many new policies have been implemented by the government and many more have been implemented. The BJP president also said that Prime Minister Modi's government has been successful in improving the condition of the Railways in the North East. "The Modi Government and the BJP have worked upon throwing out killer groups from the North East, while Bangladesh lands boundary agreement has been a success, because after the agreement, the North East has got direction," Shah said. He further said that India had sent a strong message across to Myanmar after surgical strikes there. On June 4, 2015, the NSCN-K ambushed an Indian Army convoy of 6 Dogra Regiment in the Chandel district of Manipur and killed 18 Army jawans. On June 10, India conducted surgical strikes against the terrorist camps along the Indo-Myanmar international border, and inflicted significant casualties. "About 258 per cent more funds have been given to the North East. Earlier Rs. 87,628 crore used to be provided to the North East. Under the 14th finance commission, 3,13,375 crore more money have been provided to the states," Amit Shah said. Shah also said that about Rs. 5,336 crore was given to the states for long distance connectivity and an action plan has been drawn. Such big investments are made so that students don't have to just go outside to study in IIT. 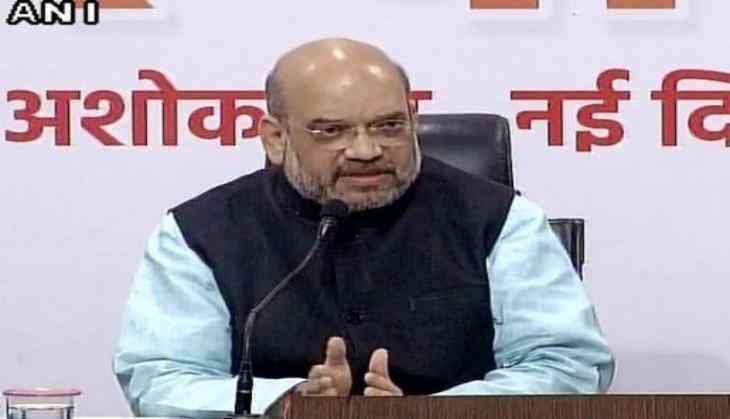 Talking about the difficulties the north-eastern states had to face, Shah said that after the formation of Bangladesh, the North East economy fluttered and relations with the states got affected. "There was no focus on terrorism and militant groups in the 65 years of Independence, and the whole negativity reached North-East and became a hurdle in the development of the states," Shah said. He added that the culture and tourism should be enhanced there, which in turn will provide employment to all the youth in the states. Shah added, "But the exploration in this area in these 65 years has been low and hence the development process slow. There was so much corruption in these states and such was its grip that development was not possible at all." He further said that things have started changing under Prime Minister's rule, adding, "It is because of PM Modi and the BJP's vision that the North East is still an important part of India. And the North East is the government's first priority and always will be." He also said that since independence, the Modi government has done more work in three years than what the Congress has done for North East in ten years, and added, "I believe that the work has not ended, it has just started."